The website already has a lot of different hacks and cheats for MCPE, but this hack combines several of them simultaneously. Vertex Client contains a variety of functions in a convenient package. After installation, you can use a variety of unique features such as walking through walls, flying, a lot of different auto-functions and much more. Feature list is below. Compatibility with Minecraft Bedrock 1.1 and 1.2. (including 1.2.14.3 at the moment). New FastLadder, ScaffoldWalk, EffectGiver, EnchantIt, CaveFinder features. Added new settings for many modules. Tip bar and Music player have been deleted. 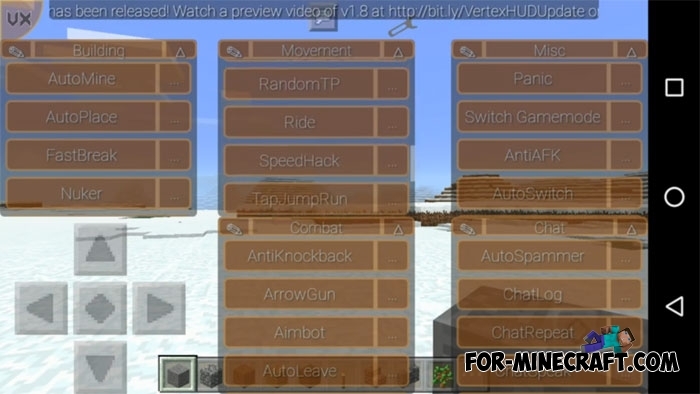 Added Watermark, AntiHunger, BunnyHop, F5 button mode setting, Hacks list Manager and more. New rainbow background and Android button style, "Table (DragOP)" menu style. Added Rotation Plus, NoFall, GlitchCam and Friend Manager function. If you set a friendly flag for the player, then his character will stand out and you will easily see him at a distance or during fights. More flexible settings including you can customize sounds, startup screen and more. Added Console in developer mode. Fixed more than 10 errors. Another impressive update which contains many fixes and new features such as: StrafeAura, Switch Aimbot, PlayerPosLocator and othrs. Some settings for new features. Mod Manager is designed to quickly change the parameters of a function. 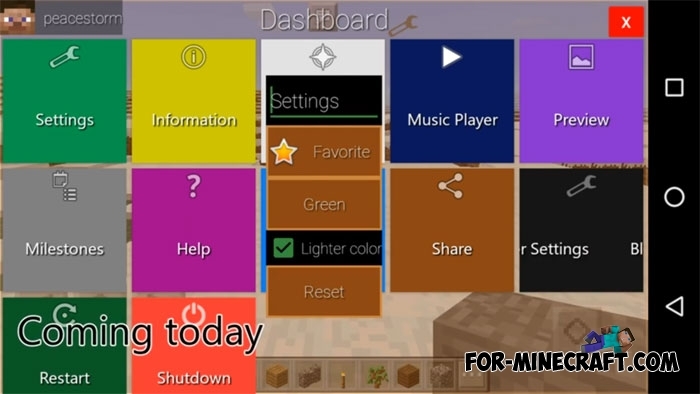 Here you can instantly change options without switching between screens. Changes in the design of the menu. A small description for some functions. Support for MCPE 1.0 (installation requires BlockLauncher 1.15.X). 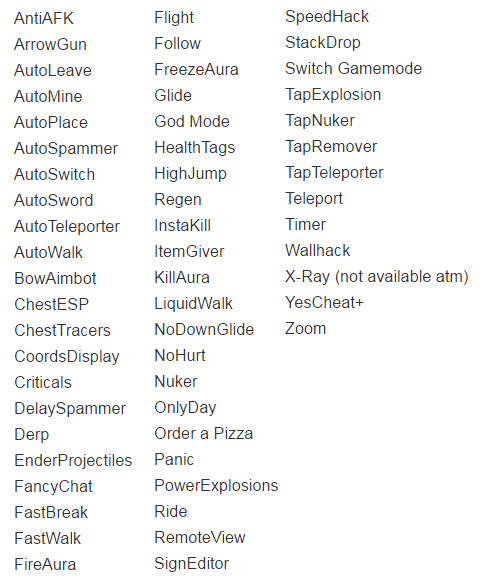 Added many new features such as TapAimbot, HealthDisplay, AttackShock, AttackTeleport and others. Added descriptions for the modes, as well as their display. Some do not work functions have been removed. This major update includes new features, control panel and commands. It works independently and only on the previous version of the game. Added a small Christmas elements. Added new position settings and hitboxes. New features such as FrostWalk, Sticky Move, Christmas screen, and other features (See the official website). 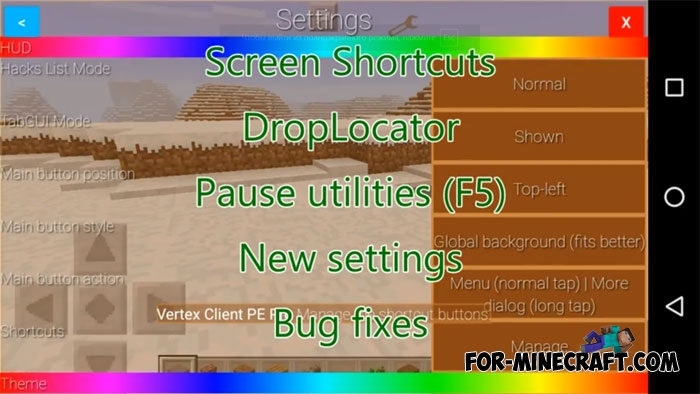 Vertex Cheat works both in a single player game and multiplayer on servers. Use it with caution, you may be banned! Addition to all this, the developer constantly updates the hack and certainly will an update for MCPE 0.17.0 after its release. First, you can configure this cheat for yourself as you want without any problems. The left side of the screen shows a menu with all available options, you can configure it or to test these functions. Furthermore it is possible to change the color of the window. Perhaps, the most unusual option is a riding on the head of another player. Currently, it does not look quite right as it should be, but nevertheless the function works. 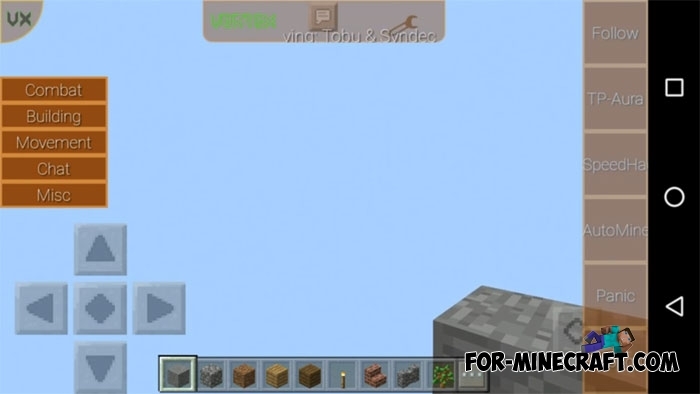 Walk through any walls is the next great and very useful function for Minecraft PE. With it, you can go through any obstacle without using tools. Also, tap only once you can make a small explosion and to leave after it a small crater. If you do not completely understand how to play with this cheat then see review below. Don't trust ANY download link on this page. The real mod should ONLY be downloaded from our official website, https://Vertex-Client.ml.